You can’t miss this place. There is a large outdoor terrace and the decor is really nice, which the windows do a great job of showcasing. As soon as you walk in, you notice the decor is a nice mix of modern and classic, working well with the metal and wood. There is usually a healthy amount of people and it is highly recommended to make reservations for brunch. The menu does have some variety within various price ranges. There are 6 preset items ranging from $4 to $12 with choices such as Muffin and Coffee ($4), Granola and Fruit ($9) and Le Santé ($12) which comes with fruit, cottage cheese, bread and coffee or tea. 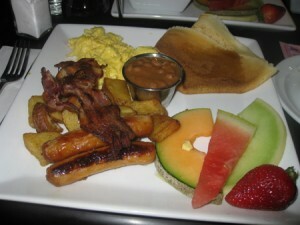 The egg menu has 3 choices from $11 to $14; tout le monde ($11) is 2 eggs, sausage or bacon, beans, potatoes and fruit. I suggest paying $3 more for the Totale ($14) which is basically the same except you get a crepe and both bacon and sausage. One odd thing about the way they make eggs, is they do not do sunny side up or over easy. I didn’t really understand why they only did scrambled, soft boiled and poached. The egg plates were nothing to write home about. The taste did not stand out, the fruit was very run of the mill and some of the breakfast meat even arrived cold. 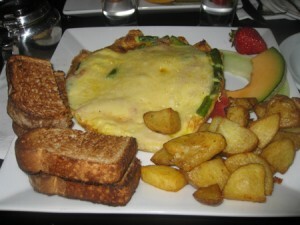 There are 5 omelets choices ranging from $9-$12. The ham, cheese and asparagus ($12) was mediocre although did have a nice presentation. 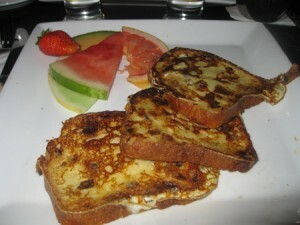 The french toast comes with 2 options (white or brown bread) $6 and raisin ($7). You do get 3 pieces of french toast which is good considering some places only give you 2, but they are quite thin. Another issue is that the fruit choice is quite limited and the slices are also thin. I received a paper thin slice of grapefruit. None of us tried the pancakes (2 per serving) of which there were 6 choices ranging from $6-$9. I usually never have any issues with the service at most places I go, although this time I did. I will actually take this opportunity to lump both the cooking and serving staff in the same section. Although we had made a reservation, our table was not ready. Two of the chairs at our table were substituted with outdoor wicker ones which made for an odd sitting angle. This kind of ghetto approach is in contract with the ambiance and decor the place gives off but that’s not the worst part. Our food was 45 minutes late. We saw people sit, eat, pay and leave before we got to eat and we were only a group of 6. One of us asked for toast so as to dunk in their hot chocolate and it took a third request to get it, by which time the drink was cold (no free replacement was offered). Some of the meat in our orders was cold, possibly due to the fact that it was made quickly and waited for the rest of the order. They could/would not make eggs over easy or sunny side up. I am at a loss as to why not since it’s really not that difficult. The best part of the brunch was that it didn’t take long for us to get our bills mainly because they sensed the dissatisfaction in our eating experience. There was clearly a breakdown in communication between the kitchen and the serving staff. 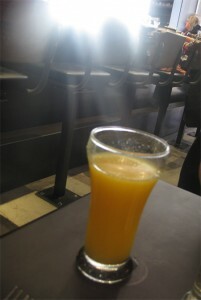 In all my years of having brunch at various places in the city, I have never had such a negative experience. In most instances of dissatisfaction, there was some kind of compensation offered such as a free coffee or something to placate the patron. There are some vegetarian options on the menu and one or two may even qualify as vegan, like the granola plate (if you hold the yogurt). The choices are decently priced. 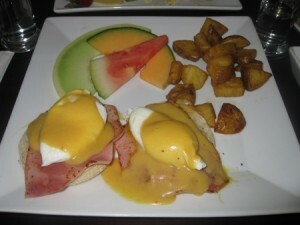 I don’t enjoy writing negative reviews but this place was the worst brunch place I have ever been to. Now that being said, it does not mean that the other non-brunch offerings are bad. In fact, I have heard good things about dinner and have gone for drinks and dessert and enjoyed what they offered. So if you want to check out this place do not come for brunch, try dinner instead. The waiters changes everyday or, at most, every week because it’s just poorly managed. They just don’t care. The “chef” is the son’s owner and about 17. The cooking staff are his highschool buddies. It’s an open kitchen concept so it’s easy to see them “work” and witness why it’s so bad. Everytime I pass by, I see sad faces and discontent people. But for some odd reasons, they go back ! It must be that decor and the Bernard Street “m’as-tu vu?” vibe. I have heard from other bloggers that it has changed and, although I do not do 2nd reviews in this case I might, although it won’t be until 2012. Thank you for sharing that information. The decor is admittedly pretty nice… but that’s not helping.